The 'D' locomotive History By Adrian Allum 333 locomotives of one basic design, delivered over an 18 year period from 1925 to 1943 is quite a remarkable achievement. The cost for each loco at the beginning was much cheaper than other European locos of the day. This was the 2-6-2 ( or 1-C-1) electric locomotive, type D.
There have existed many variations of the D-loco, including a solitary 1-D-1 version, and following the arrival of the Jeco H0-scale model of the Du-loco and the Roco H0-scale model of the Da-loco, here is a very brief peak at the D loco story! It would not be unfair to distinguish between the D and the Da. The latter is very visibly different and was built much later, from 1952 to 1971 (arguably). The claim of 333 locomotives applies to the D only. 321 of these locos were delivered directly to SJ, having been built by ASJ Falun, Motala Verkstad, and NOHAB Trollhättan. 9 of the others were delivered to BJ (Bergslagernas Järnvägar), and the remaining 3 to DJ (Dalslands Järnväg). These 12 were acquired by SJ in 1948 and are visibly different with slightly raked cab-end windows. Other detail differences have existed, most notably the fact that the first 134 locos had wooden bodies. Many of these were replaced with steel, and a few with "running repairs" had steel cabs flanking wooden engine-room bodies! Although known as the D series, and complete with number plates denoting this fact, the locos were in fact designated originally as Dg or Ds. The Dg signified a loco geared for a top speed of 70km/h for Goods traffic, and the Ds signified a loco geared for 90km/h for passenger (Snälltåg) traffic. This latter type increased the average speed on a Stockholm to Göteborg journey from 53km/h to 76km/h. Later, the Dk loco arrived, this had a different motor and was permitted at speeds up to 100km/h. Loco 406 was the first Dk, but a number of earlier Dg and Ds locos (the latter especially) were modified. 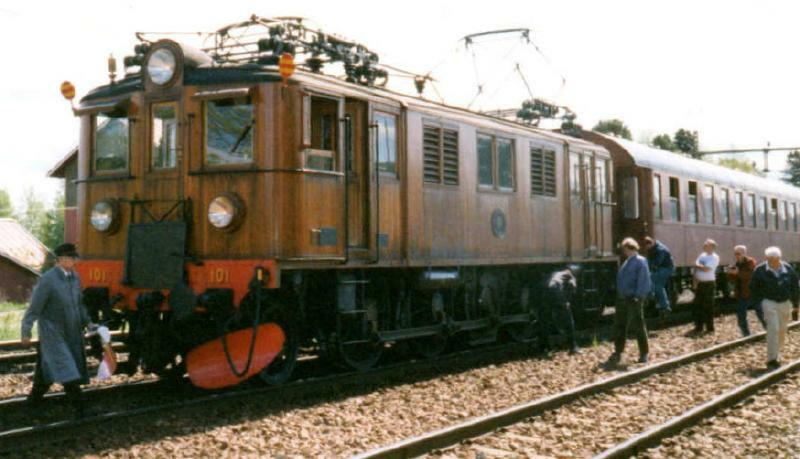 Loco 415 appeared as new, as a Dr permitted to 120km/h, but was modified several times. For a brief period, loco 208 was modified to a Dr, but no other loco is believed to have received this modification. However, the nine locos acquired from BJ (where they were classified Ds) were out-shopped as Dr2. Whilst classified Dr or Dr2, different profile coupling rods were fitted, but the designation was short lived. (The three locos acquired from DJ (where they were classified Dk were out-shopped as Dk2). Following service with loco types F and M where more voltage steps were used in the controllers, a D locomotive was suitably modified (number 208, again, which was in works for repairs following collision damage), and this became Df In the early 1950s, it was used on trains 93 and 94, The North Arrow / Nordpilen, which were the heaviest express passenger trains in Sweden at that time (operating between Stockholm and Ånge / Långsele). It remained the solitary example. The 1948 Locomotive Committee decided to work on a prototype for a future ore train locomotive of the coupling rod type, building on a normal D locomotive. The locomotive that was chosen for this experiment was number 136, which was already undergoing repair of collision damage and was being modified in some other respects. The locomotive was split at about the middle, and the framework was extended by two meters. An extra wheel-set, giving the locomotive axle notation 1-D-1, was also fitted. The locomotive, previously a Dg, was fitted with a steel body and the type KJ-137 motors, while the previously used gearboxes for 75km/h were retained. The locomotive was delivered in the rebuilt state in 1950 and designated Dg2 One year after the renovation the Dg2 was fitted with KJA-137 motors, as previously procured for the Df loco. The motors for the Dg2 locomotive were re-designated KJB-137. These two motor types were prototypes for the generation of new motors for the D locomotives, which ASEA had for some time been developing. The Dg2 locomotive was initially located in Bollnäs and served mainly the line, Ånge to Hallsberg. After some time the locomotive was transferred to Gävle, where it was used mostly as a strategic reserve for Bk locomotives, but also for special transport tasks such as ore trains on the route Örbyhus to Domnarvet. Experience of the Dg2 locomotive as well as the previously mentioned Df locomotive was widely used in developing the Da locomotives. The Da was a result of the 1948 committee's agenda, and although it shared the same chassis (more-or-less) with the D, there were principle differences. The Da had new bearings in the drive wheels, the cooling air intakes were placed on the roof, they had multiple links so that up to three locomotives could run together, and the look was more modern (slightly rounded body ends, better rubber-surrounded windows, etc). The Da locomotive was instantly a universal locomotive, which could replace both Dg and Dk locos (the Ds was now mostly Dk. On lines with up to 10¹/ooo gradient the Da locomotive can drive 650 ton of express train at 100km/h and 900-1000 ton of goods trains at 60-70km/h. The newly developed traction engine type KJC-137 was manufactured not only for 'Da' and 'Dm' locomotives, but also for a large number of the D locomotives, which by replacement of the engine and, where appropriate, fitting of gearboxes for 100km/h, became Du and was thus transformed into a Universal loco. With Du locomotives, it became possible to drive fast trains with 50 tons of trailer weight higher than with the 'Dk' at 90km/h and just as heavy goods trains with the Dg at 60-70km/h. In 1967, two Du locomotives, Nos. 371 and 358, were prepared for multiple operating and relabelled Du2, the first of many. As part of the modifications for multiple operating, the locomotives were provided with roller bearings on the coupling rods, and the lubrication facility was improved and supplemented with detection devices. Multiple coupled Du2 locomotives were allowed to take goods trains at a speed of 90km/h with a maximum train weight of 1300 ton, the same value as applied to Rc and later Ma locomotives. This would bring about a substantial improvement in standards for goods traffic. The first withdrawal of a D loco was in 1936, after number 106 caught fire! Larger scale withdrawals commenced 1962 at a modest pace, not really picking up until nearly ten years later. Today, there are no D locos in service (a small handful have been preserved), but just a few Da locos remain with the private operators. All Dm locos have gone, but quite a few of the legendary Dm3 locos remain in service on the ore trains ... and one has actually been preserved already! In 1986, Rc6 1396 broke the D loco's claim to the biggest type series, as it was the 334th such loco. The Da loco, as a single unit, remained just that, a Da. On the Malmbanan Luleå-Narvik, it became necessary to replace the ageing Of locomotives that pulled the ore trains. In connection with the Da locomotive SJ ordered also a two-part version with shaft rotation 1-D+D-1 and known as Dm (where the m is said to signify 'malm'). Many parts of the locomotives were built as Da locomotives, but they had an extra driving axle (instead of one of the trailing axles) and only one cab. The first series of locomotives were in service during from 1953. In the 1960s, SJ ordered an additional fifteen locomotives, which were a little different in design. The loco had a new type of engine and a thicker frame, making them heavier and thus could benefit more. NSB had a Norwegian counterpart, the El 12. Four El 12 locomotives were built for NSB 1954-1957. A Dm locomotive could pull rains weighing up to 3400 tons. To increase the capacity further, between 1960-1970 nineteen 'parts' of Dm locomotive were built to allow the train weight to be raised to 5200 tons. These parts of the Dm, were built as an ordinary locomotive, but without cabs or trailing axle. They were type Dm3 and then connected permanently with the nineteen Dm locomotives. Dm3 is now the term used to describe the whole 3-part loco, but it was originally just the centre unit. From 1979 and well into the 1980s most of the locomotives were modernised, the drivers-side cab doors were moved and the lights were changed to smaller Marshal headlights. Some locomotives remained in the original design. Dm and Dm3 locomotives were used in the same rosters on the Ore Line. With rationalisation, the number of trains in the 1980s dwindled and most of the Dm (20 locomotives without middle) were moved south to Bergslagen. They pulled the freight trains on the lines including Gävle-Borlänge until the early 1990s when the locomotives were scrapped. The Dm3 locomotive fleet has continued to serve the Malmbanan but will within a few years be superseded by the IORE. The locomotives are now owned by Ore Transport in Kiruna (MTAB) who has taken over the ore traffic from SJ, and locomotives are now painted blue, and are named after various mines. During the 1990s, locomotives were modernised further with enhanced driving cabs and upgrading of the mechanical and electrical systems.